Classic wound drainage is still common in hip replacement but its benefit is doubtful. The role of systemic administration of proteinase inhibitors like aprotinin to avoid perioperative blood loss is still unclear. In a prospective randomized trial, the perioperative blood loss in alloplastic hip replacement under the influence of proteinase inhibitor (aprotinin, Trasylol®) using wound drainage as well as compression treatment alone were compared. 80 patients were prospectively randomized in 4 arms. 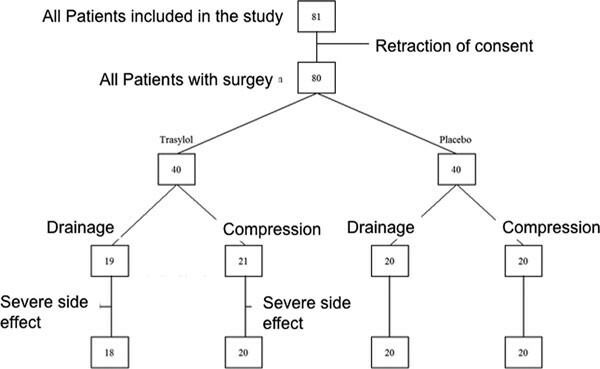 Patients received either aprotinin or placebo during surgery as well as drainage or targeted external wound compression. Observing the "drug therapy" aprotinin had no effect on the intraor postoperative blood loss (p > 0.05), a trend to lower postoperative hemoglobin decline was found, but without significance. thrombosis occurred in neither the aprotinin nor in the placebo group. Two patients had a severe allergic drug reaction and were excluded from the study. Under "non drug therapy" with compression therapy and wound drainage a significant difference in blood loss was found (p < 0.001). The blood loss was higher under the wound drainage. There was no influence on the infection rate. Yet we could observe increased bruising under the sole external compression treatment. The administration of aprotinin did not achieve the desired reduction of perioperative blood loss. Hence, costs and two severe allergic drug reactions in our study represent arguments against its use in regular treatment. Furthermore, it seems that wound drainage is neglectable in hip replacement and can be substituted by a sole compression treatment. Surgical dissection of soft tissue and bone in arthroplasty of the hip joint can cause substantial bleeding and is responsible for intraand postoperative blood loss. The intraoperative blood loss can be reduced by using mainly blunt tissue dissection as far as possible, reduction of tissue trauma, local hypothermia and pharmacological influence on the body's blood coagulation mechanism [22, 42, 56]. Furthermore, the postoperative blood loss is influenced by the effectiveness and durability of the body's own hemostasis, external tissue compression, and particularly by the method of wound drainage. In 1954, the French surgeons Redon, Jost and Torque evacuated glass bottles to promote drainage of wound secretion after surgery. This was the beginning of the era of postoperative suction drains [7, 9, 10, 12]. The idea behind wound drainage is an optimized balance of secretion and accumulation of blood and the internal adaptation and stabilization of wounds. Over the years, the drainage technique developed with various modifications [18–21, 23, 25]. Aiming to avoid postoperative complications and to provide additional positive effects on wound healing, the postoperative secretion drainage using Redon drains is now a standard method for European Orthopaedic-Trauma surgeons . However, there are serious numbers of complications possibly caused by wound drainage [24, 26, 29, 31]. One major disadvantage is the risk for retrograde wound contamination with bacteria. Other reasons are the cytoadhesive properties of polymeric drainage systems, increased postoperative blood loss caused by the contact of the drains with tissue surfaces. There are also arguments of injured vessels and impairment of wound healing through foreign body reaction as well as the release of toxic plasticizers, especially when using drainage made of polyvinyl chloride [24, 26, 31, 32]. Concomitantly, numerous studies have addressed the positive effects of a drainage free surgical technique [15, 21, 28, 34]. These results show that wound drainage can be waived for certain surgical procedures without the risk of impaired wound healing. the question is whether the prophylactic use of suction drains for the patient really is an important procedure to prevent complications or whether it increases the risk for postoperative blood loss and wound infections . Another cause of increased blood loss in arthroplasty can be an imbalance in the hemostasis system [29, 61]. tissue injury induces the release of proteolytic substances which increase fibrinolysis, leading to a relative lack of endogenous proteinase inhibitors like a-antiplasmin and a-macroglobulin. the proteinase inhibitor aprotinin (trasylol® Bayer, Germany) interrupts this mechanism, as it interferes in regulating the mechanisms of bleeding and thereby may reduce perioperative blood loss. Aprotinin, a kallikrein inactivator, was discovered in 1930. It was isolated in 1936 as a trypsin inhibitor by Kunitz and northrop from bovine tissue [4, 5, 35, 40]. these results have been confirmed by many studies showing that aprotinin is able to inhibit a variety of proteinases. Royston and co-workers showed that high doses of aprotinin during cardiac surgery significantly reduced blood loss . Although this effect was achieved through an inhibition of fibrinolysis, there was no increased rate of thrombosis. these results triggered a growing interest in aprotinin and led to a number of studies in cardiac-, vascular-, liverand in orthopedic surgery [3–5, 11]. The investigation of our study was whether there is a need for suction wound drainage in cement less hip replacement im comparison of wound compression. on the other hand, we sought to analyze whether an intraoperative administration of proteinase inhibitors like aprotinin may lead to a reduction of the perioperative blood loss. In a prospective randomized study, patients older than 18 years undergoing elective implantation of cement less arthroplasty of the hip due to manifest coxarthrosis were included (Figure 1). The study was approved by the local Ethics Committee. Patients with a known intolerance to aprotinin, pre-existing coagulation disorders or undergoing drug therapy for regulating coagulation were excluded from the study. The study was a prospective, randomized doubleblind parallel trial with 4 arms comparing 80 patients (intention to treat) (51-80 years, 43 38 d"). We compared trasylol® against placebo in one trial and suction drains versus external compression on the other. All patients were exclusively treated by 2 experienced surgeons participating in earlier studies. Drugs consumed by the patients on admission and during the course of the study were recorded as adjunctive therapy in the protocol. Adverse events between consent and beginning of the studyand the causality between event and study procedure were documented. undercurrent diseases and manifestations were considered as "adverse events" and were reported. In totally 80 patients could be included for the trials. From this overall population group, 2 × 40 patients were randomized receiving either for receiving intraoperative 250 ml of a solution containing 500 ku of Trasylol® or 250 ml 0.9% NaCl as a placebo. In addition, each group was subdivided into two arms, either with wound drainage by suction drainages, (n = 20) or with a specific external wound compression (n = 20) (Figure 2). External wound compression in a patient. The implantation of cement less hip arthroplasty type Zweymuller was carried out on the transgluteal access according to the Bauer procedure. At the end of the operation, the surgeon received the randomized information whether the wound should be treated with two (subcutaneous and subfascial located) suction "Redon" drains or with external compression (Figure 2). Drains were removed at the 2nd postoperative day. There was a daily inspection and clinical documentation of the wound healing. A main objective of this study was to analyze the amount of perioperative blood loss, resulting from the intraoperative blood loss, blood loss via wound drainage and the size of the hematoma constituted at the wound area. The intraoperative blood loss was calculated based on the collected amount of fluid. The intraoperative administered amount of volume of Ringer's solution was subtracted from the total amount of fluid trapped. Therefore all swabs and tissues were weighed preand postoperatively. The difference between the pre-operative and postoperative weight was divided by the specific gravity of blood (1.06 mg/ml). For all patients with suction drains, the entire post-operative blood loss of suction bottle was documented. All patients received ultrasound (US) diagnostic by the same examiner screening for hematoma at the 2nd and 14th postoperative day. The volume of the detected hematomas by US performed was added to the perioperatively counted loss of blood. Blood samples were drawn for every patient preoperatively and at the 1st and 2nd postoperative day. Blood transfusions were performed and documented according to the approved study protocol (Hb <8 mg/l). All patients received a duplex ultrasound to exclude or objective venous thrombosis on the 2nd postoperative day. The influence of two factors"drug-" (aprotinin/ placebo) and "non drug therapy" (drainage/compression) were examined. Data collection was carried out with the spreadsheet program Excel and data processing with the statistical programs SAS and SPSS Version 16. All data were collected in boxplots and the median was described. The significance level was set at p < 0.05. Comparison of the groups was descriptive for important parameters such as age and gender. A two-way analysis of variance was performed for the total blood loss and exploratory at first for hemoglobin and the 2nd postoperative day, respectively. The analysis of variance was tested for interactions. Each group of patients was equal concerning the demographic data. Two patients, one in the drainage and one in the compression group developed a severe allergic reaction after Trasylol® medication and were excluded from further analysis, resulting in a final population of 78 patients. The patients in the Trasylol® group (n = 37) reached a median blood loss of 507 ml (123-1141 ml). The median blood loss in the placebo group (n = 40) was 517 ml (132-1226 ml). In comparison of the medians patients with Trasylol® lost 10 ml more blood perioperatively than patients with a NaCl the placebo, the latter had a larger range. These results were however not statistically significant. 18 patients with intraoperative drainage receiving Trasylol® had a median blood loss of 620 ml (190-1525 ml). 20 patients with intraoperative NaCl placebo lost a median of 615 ml (100-1260 ml) blood, resulting in a median of 5 ml less blood loss in the Trasylol®-treated group. In one patient of the Trasylol®/drainage group, a hematoma with the size of 12.3 ml on the 2nd postoperative day was observed, which did not further increase (5.6%, 1/18). In one patient in the Trasylol®/compression group, a hematoma with a size of 32.6 ml on the 2nd postoperative day developed, which was reduced on the 14th postoperative day to 14.4 ml (5%, 1/20). In the placebo/drainage group 4 patients showed hematomas in the operated wound area, 3 hematomas of 10.5 ml, 11.8 ml and 7.4 ml were found on the 2nd postoperative day. One hematoma increased in fourteen days to a size of 32.6 ml. Furthermore, one hematoma was diagnosed on the 8th postoperative day with bleeding after drainage removal at the 2nd postoperative day. One patient, whose examination was without result on the 2nd postoperative day, developed on the 14th postoperative day a hematoma of 11.8 ml. (20%, 4/20). Five hematomas (average size 18.7 ml, range 10.0 35.2) in the placebo group/ compression group were diagnosed on the second postoperative day, one of these increased in fourteen days to a size of 14.3 ml. On the 14th postoperative day, bruises of 25.0 ml and 12.5 ml were seen in two patients (35%, 7/20). Summarized, the Trasylol®/Redon group showed the lowest number of total hematoma. Patients in the Trasylol®/drainage arm (n = 18) showed a median blood loss of 1201 ml (704-1648 ml). Oppositely, the Trasylol®/compression group (n = 20), presented with a median blood loss of 596 ml (245-1141 ml). 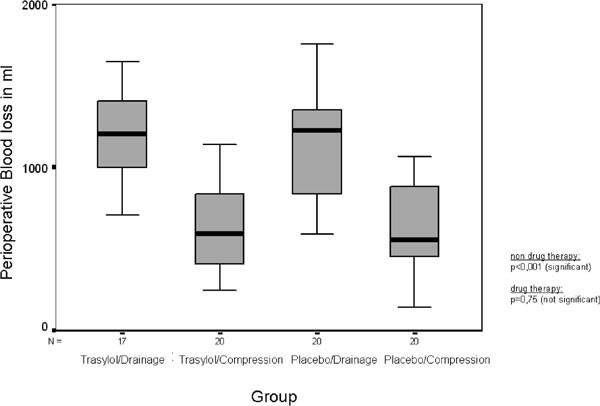 The blood loss in the placebo/drainage group (n = 20) had a median of 1223 ml (592-1756 ml), while in the placebo/compression group (n = 20) a median blood loss of 554 ml (143-1063 ml) was measured. 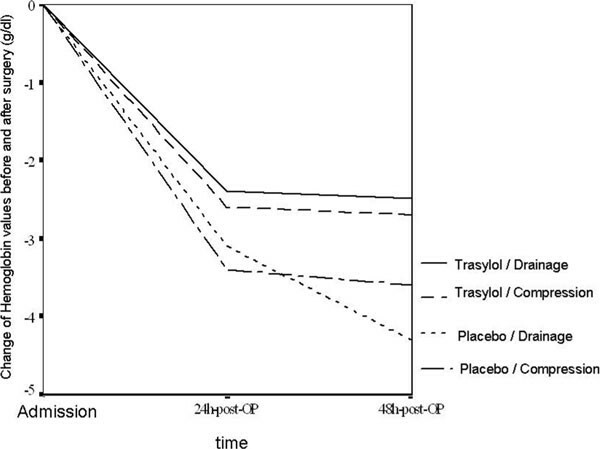 The blood loss under the influence of the "drug therapy" with Trasylol® was not significantly different from placebo (p = 0.7540). On the other hand the „non drug therapy" showed a significantly higher blood loss in the wound treatment with suction drainage instead of compression (p < 0.001). The mean of erythrocyte concentration of the Trasylol®/drainage group (n = 18) was preoperatively 4.1 × 106 (3.6 5.0 × 106/μl), decreased on the 1st postoperative day to 3.5 × 106/μl (2.8 4.0 × 106/μl) and remained constant on the 2nd postoperative day with 3.5 × 106/μl (2.8 to 4.1 × 106/μl). For the Trasylol®/compression group (n = 20), the mean of preoperative red blood cell concentration was 4.2 × 106/μl (3,4 5,0 × 106/μl), decreased on the 1st postoperative day to 3.6 × 106/μl (1.8 4.2 × 106/μl) and on the 2nd postoperative day to 3.5 × 106/μl (2.8 to 4.1 × 106/μl). Preoperatively, the mean erythrocyte concentration of the group placebo/drainage (n = 20) was 4.4 × 106/μl (3.5 5.0 × 106/μl), decreased to on the 1st postoperative day to 3.3 × 106/μl (2.9 to 4.1 × 106/μl) and remained unchanged on the 2nd postoperative day with 3.3 × 106/μl (2.7 'to 3.9 × 106/μl). The mean of erythrocyte concentration in the placebo group/compression (n = 20) was preoperatively 4.3 × 106/μl (3.3 to 5.2 × 106/μl) and felt at the first postoperative days to 3.4 × 106/μl (2.7 4.0 × 106/μl) and on the 2nd postoperative day to 3.1 × 106/μl (2.6 to 3.9 × 106/μl). Patients treated with Trasylol® had a smaller postoperative decrease in red cell concentration than the placebo groups. The highest difference was found on the first postoperative day. Figure 4 shows a lower postoperative decline in hemoglobin values in the Trasylol groups. The difference is not significant. 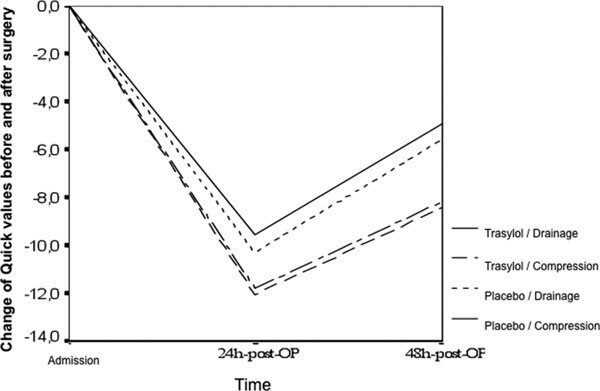 Box and Whisker Plot of the perioperative blood loss. The upper line of the box shows the 75% quartile of all values, the lower line the 25% quartile. The line in the middle of the box is the median. Postoperative decline in hemoglobin values. We could not find a difference in the infection rate in all groups. The postoperative coagulation values are shown in Figure 5. No significant difference was detected between the Trasylol® and the placebo group. Postoperative changes of Quick values of each group in relation to baseline. Figure 6 shows the platelet concentration before and after surgery. No significant difference was detected between the Trasylol® and the placebo group. 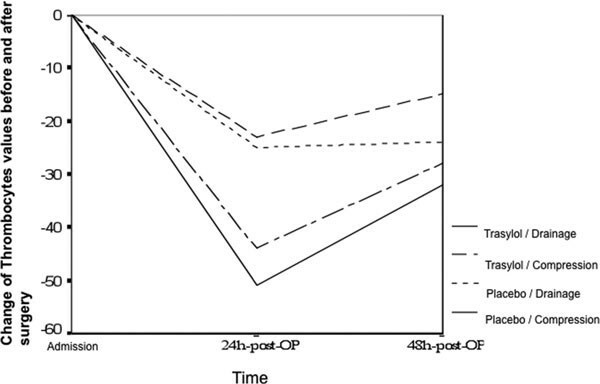 Postoperative changes in platelet concentration of each group in relation to baseline. In the Trasylol®/drainage and Trasylol®/compression group, one patient each showed an allergic reaction to Trasylol® and was excluded from the study. In the placebo/drainage group, one patient developed a postoperative hematoma which had to be drained surgically on the 8th postoperative day with consequent removal of the prosthesis due to wound infection. The further course of this patient was uneventful. Another patient had the drainage removed due to abundant secretion from the wound. The further postoperative clinical course was uneventful. In the placebo/ compression group, one patient developed a large postoperative hematoma which was growing in size and was initially treated conservatively. Since a dislocation of the prosthesis occurred during mobilization revision of the hip with prosthesis changes was performed at 6th postoperative day. The further course was uneventful. In another patient a bad-fit brace had to be removed after 24 hours. In the further course no additional complications occurred. The extent of perioperative blood loss is undoubtedly an important aspect of surgical quality. The objective of operative drainage is to avoid the loss of blood and wound fluid. Yet, these can be a potential breeding ground for bacteria or inhibit adequate wound healing. In recent years, the routine use of wound drainage was questioned due to a lack of data on the benefit of the drainage of blood or secretions on wound healing. Moreover, several publications suggest that wound drainage can result in an increased hemoglobin drop with a higher rate of blood transfusions, especially in endoprosthetic surgery of the knee or hip joint. In a retrospective study of 364 patients with a hip prosthesis implantation, Hallstrom and Steele compared wound drainage with wound compression and found a significant higher difference in blood loss for the drainage group . Ritter et al. demonstrated that total hip replacement with drainage increased transfusion volume on an average of 95 ml of blood per patient as compared to total hip replacement without drainage . However, no increased transfusion requirements were documented after implantation of knee replacement. A retrospective study by Reilly et al. for knee replacement revealed a significant decline in hemoglobin and a significantly higher transfusion rate in patients with wound drainage . pital transfusion rules than the actual blood loss. In not drained wounds more ecchymoses occur. Hallstrom and Steele reported a hematoma rate in the undrained wounds of 11.4% versus 2.3% in drained wounds and Holt et al. describe 69% versus 39% . In addition, secondary hematomas have been described after removal of drains. Werner et al. attributes this to the destruction of vascular structures, which are attracted to the vacuum in the lumen of the drainage . Kirschner, Wolter and Tittel et. al. showed that the drains under "high vacuum" conditions (about 80 kPa) are just of short time use, since the lumen of the drainage tube is quickly occluded by aspirated tissue [31, 55, 60]. Parker suggests that the hematoma rate is not affected by drainage . Even in our study we found a hemato-seroma one week after the removal of the drainage tube. An additional parameter for measuring the total postoperative blood loss was ultrasound examination of the wound area, which allows a reasonable estimate of any fluid collection. In our study we did not find hematoma as frequently in the compression group as compared to the drainage group. of thrombosis, hemostasis and prevention of edema. In our study, we used ProThera-Huftorthesen (PolyMedics, Peer Belgium), which were individually adapted preoperatively to patients' proximal thigh. Only once the brace had to be removed because of pain and a loose fit after 24 hours. In comparison to winding compression bandages, the procedure was perceived by patients as comfortable and gave stabilizing. Even in the absence of drainage therapy, there was no increase in the rate of hematoma. Additionally, there was a reduction of postoperative blood loss. Furthermore, we investigated the effect of aprotinin on perioperative blood loss. Recent research results from cardiovascular and orthopedic surgery, a described reduction in perioperative blood loss due to aprotinin medication has been described [4–6]. The antifibrinolytic effect of aprotinin raises the question of favoring intravascular thrombosis. In formal testing, no significantly increased rates of thrombosis have been shown. One explanation for this is that aprotinin causes a stabilization of the platelet membranes. This results in inhibition of thromboxan release and platelet aggregation which counteracts clot formation. The desired hemostasis by aprotinin is therefore not associated with increased thrombogenesis and does not increase the thromboembolic risk. This concept is in line with our study, as we did not find any evidence of any aprotinin induced increase thrombotic events. However, it is important to note that only clinically manifest thromboses were recorded, a targeted search, with the help of a venography was not performed routinely. Murkin et al. investigated in several studies the impact and side effects of aprotinin in surgical procedures [39, 40]. With bilateral implantation of hip joint prostheses or hip arthrodeses the average blood loss was reduced by Trasylol® from 2098 ml to 1498 ml, without increased incidence of deep venous thrombosis. Also Samama and Leche et al. obtained in their studies a similar result regarding the influence of aprotinin in orthopedic surgery a similar result [51, 52]. Similarly Jeserschek et al. could show in a prospective randomized study a significant reduction of blood loss after administration of high dose aprotonin when performing hip and knee replacements and excisions of soft tissue sarcoma . On the other hand, Kasper et al. didn't find a reduction in blood loss by aprotinin medication in arthroplasties of the hip [30, 35]. Our own study provided a similar result, since with aprotinin treatment the overall blood loss was not affected. The difference in total blood loss between Trasylol® and placebo groups was clinically insignificant and without statistical significance. Aprotinin had no discernible effect on the amount of transfused blood. Meanwhile, despite the possibility of a modest reduction in the risk of massive bleeding, the strong and consistent negative mortality trend associated with apro tinin, as compared with the lysine analogues, precludes its use in high-risk cardiac surgery. Following the results of the "BART trial" the manufacturer has withdrawn Trasylol® from the market [1, 2, 8, 13, 14, 16, 17, 27, 33, 36–38, 41, 44–46, 48, 53, 54, 57]. Even in our study two patients developed severe allergic side effects. Our study shows that the blood loss in hip surgery is not reduced by the use of aprotinin. Furthermore it seems that wound drainage is not necessary when an external compression of the wound is performed. F Fleischmann, C Matuschek, K Orth, E Bdlke and W Fleischmann contributed equally to this work.